The Gaitometer was an iPhone and iPod App that was available from 2011 - 2017. Due to changes in the Apple iOS operating system this App is no longer available, and the information on this website is provided for informational purposes. Following an injury or surgery involving the lower body, an abnormal gait pattern often develops. Even after the injury heals, this irregular (asymmetric) gait pattern may persist for months, years, or even become permanent due to the development of a poor gait pattern that occurs during the period following the injury or surgery. The Gaitometer is designed to measure the asymmetry of the step pattern when worn by the user, and provide real-time audible and visual feedback. This feedback can assist the user in reducing or eliminating these types of gait abnormalities to achieve a more normal healthy gait. The Gaitometer was an application available for the iPhone and iPod touch that uses the built-in accelerometers in these devices to detect and analyze the basic step symmetry of the user. This measure of symmetry is calculated as a “Gait Ratio”, where the duration of each step is compared to the duration of the previous step (gait cadence). A symmetric gait cadence will yield a Gait Ratio value near 1.0, while an asymmetric gait cadence will yield a Gait Ratio substantially higher (as shown). 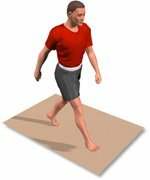 A selectable Gait Warning sound is used to provide immediate feedback to make the user aware of the gait irregularity, and allow the user to potentially reduce the gait irregularity. The Gaitometer should be worn firmly at the CENTER OF BODY. Using a belt clip, fanny pack, firmly fitting backpack, or sliding under the center beltline will yield the best results. DO NOT wear the device in a side pocket, on hip, on arm, or in a loose article of clothing. The Gaitometer will work best on consistent surfaces such as sidewalks, running tracks, treadmills, etc. The Gaitometer was originally designed and patented as a self-contained hardware device to provide real-time human gait analysis and therapy. The Gaitometer was then made available as a stand-alone application for the iPhone and iPod touch. The Gaitometer is designed by Dr. Jeffrey Silk, president of Silk Scientific, Inc. The use of the Gaitometer is not a substitute for individualized gait analysis and therapy by a trained professional. Copyright © 2018 Gaitometer.com All rights reserved.